Improve your landscape and garden with a water garden or Koi pond. Add a sturdy garden bridge. Create a bubbling fountain from any ceramic pot. Learn how at ExtremeHowTo.com. Build a Compact Container Water Garden No backyard? No extra landscape space? No problem. You can follow an illustrated, step-by-step guide at ExtremeHowTo.com and create a beautiful water garden in a container. Have a Fountain in a Ceramic Pot Here's how to turn any ceramic pot into a bubbling fountain for your garden, deck or patio. 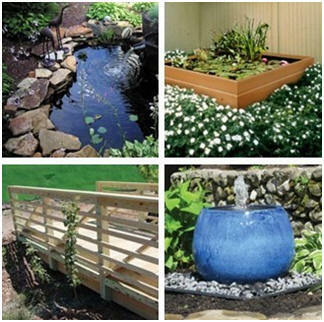 How to Build a Backyard Bridge Have your walkway span a water garden, pond, creek or marshy area of your property. This illustrated guide will show you how to build your own sturdy and attractive small bridge. Extreme How-To magazine provides the latest information on tools, techniques and home-improvement technology for the extreme handyman. It's a comprehensive resource for today’s do-it-yourselfer. Having the right equipment, materials and building strategies to complete tasks is of crucial importance. Answering this demand, Extreme How-To provides tips on everything from adding a room, creating a patio or refinishing a deck, to installing a window, building a retaining wall or reconstructing a floor.